NEW!! Looking for your Input! Tired of off-white walls? Learn what colors are right for your home! We work with First Oriental Rug. They offer world class collections of antique, decorative and contemporary rugs from Iran, Romania, India, Egypt and Tibet. Check out their website at www.FirstRugs.com. The lazy, hazy days of summer are finally here! Many of us are on vacation and enjoying weekend trips to the lake, beach or mountains. Check out our main article on color and changing your space through paint. Having a painting project done while you are on vacation is a great way to put the "wow" into returning home. We are also available to oversee any projects. We appreciate your readership! We are working on a color presentation for a speaking engagement and thought that this would be a great time to talk about how color affects us and our surroundings. Now is the perfect time to have new color put on your walls and change the look of your home. Some of our clients have interior painting done while they are away. They don't have to deal with the mess and when they come home, voila...a new space! Last Chance to Save on Hunter Douglas Window Fashions! 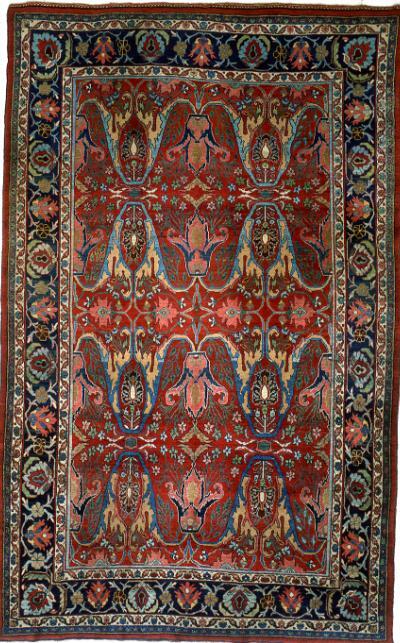 First Oriental Rug, in Acton and Danvers, offers beautiful antique and decorative rugs from Iran, Romania, India, Egypt and Tibet. The helpful staff there can guide you through the many fine rugs in the showroom, explaining their history in depth . They also carry rugs that would work in a contemporary setting. These Oriental rugs are truly works of art and would finish any room. See their website at www.FirstRugs.com. We hope you enjoy our newsletter! We'd love to hear from you about what you'd like to see in future newsletters. We welcome any comments or questions you might have regarding decorating and design. Please email Eva at evacrowley@jacdesignerservices.com.